Sophia, a bright 16 year old student, is writing an assignment on osmosis. Not surprisingly, Sophia is bored with her text book! She quickly googles the term; reads a section of an eBook and watches a two-minute video on the same. Sophia is Gen Z. In this article we will examine how to turn next-gen into a competitive advantage. Sophia is interested in how an osmotic power station is being used to generate electricity in Norway, based on the principles of osmosis. The way that Sophia works, shows that Gen Z is different! 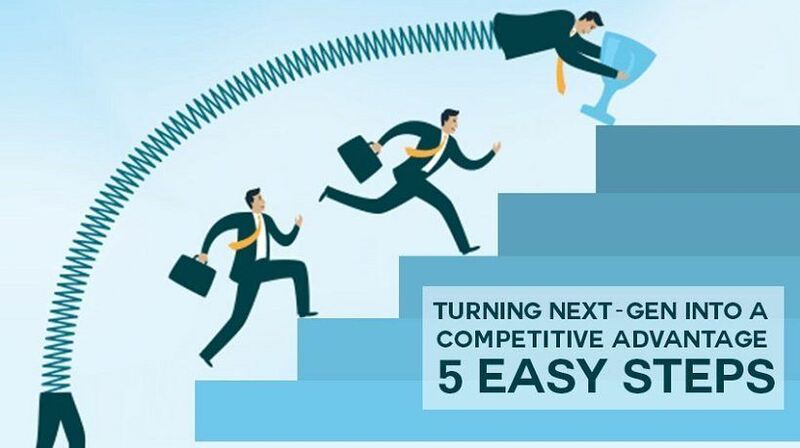 Here are 5 simple steps on how to turn next-gen into a competitive advantage. Back in the 1990s, students and learners held their books dearly. So much knowledge and technology was never available at a click. Today, there is available a massive database, all ready to be consumed and utilized by who-so-ever is interested! Just as importantly, this has reshaped business operations dramatically. And organizations have to be ready for the next-gen worker. Will Gen Z become the next big challenge or asset? Achieving the latter will involve understanding their mindset, rationalizing pedagogical requirements and comprehending evolution patterns. Simply put, companies have to provide resources for a new generation to work in ways that fit naturally with their digital upbringing. Following are the 5 steps in which you can easily train next-gen employees to leverage a competitive advantage. Gen Z and younger Millennials are eager to learn- they are a prescient lot. Higher education benefits and training courses that help them stay ahead of the curve are more important. They possess a willingness to learn which can be used by organizations to build a cross-functional and diversified, yet agile team. Leadership attitude, goal alignment and complementary skill sets are necessary traits of an agile team. Gen Z workers are a perfect fit for a ‘mature’ environment. 2. Speak To Their Nature. A new study by Randstad US found that 17 % of Gen Z want to start their own business. This is directly related to their ‘willingness to learn’. With easier access to more information, people, and resources, they are more interested in entrepreneurship. Companies, big or small, should take advantage of this mentality-turning them into leaders for promoting growth and success of the business. Corporations may face trouble recruiting this generation if they don’t employ an entrepreneurial operation model. According to Randstad, those organizations that understand and address Gen Z’s preferences and tendency toward entrepreneurship will have great advantage in hiring the newest workforce. Generation Z has an attention span of 8 seconds. So training this generation is even a bigger challenge! Therefore, it is important to keep the course short. This translates into building content into a course which is- curated, chunked, crisp and absolutely impactful. Bite-sized modules with engaging content appeals more to this type of generation. Moreover, they are visually orientation as compared to millennials, preferring videos over long and dreary texts. According to a survey, 32 % watched videos for at least an hour every day. Clearly, videos have a lot of influence. Generation Z are digital natives - they have been susceptible to digitalization since their birth. They are even mobile first. Gen Z on an average spend 15.4 hours per week on their smartphones as compared to 10.6 hours on their laptops. Corporations should utilize this ethos to deliver mobile learning solutions. BYOD plus mobile learning is a good combo, which can help make on-job and on-the-go training much smoother. 5. Social Learning And DIY. They are also living in a time of social media. Daily usage of social media sites like Snapchat, Facebook, and Instagram is very high amongst gen-next. Organizations can deploy social learning for employee development and engagement. Furthermore, this generation is not only eager-to-learn but also eager-to-share. They are happy to co-create a culture and share their knowledge. They find themselves capable of self-managing work and sharing it for everybody’s good. Gen Z are adept researchers. They know how to self-educate and find information. 33% watch lessons online, 20% read textbooks on tablets, and 32% work with classmates online. Companies should use this to uplift organization culture and knowledge transformation. This article reiterates the need to understand and engage Gen Z workers to win a competitive edge for your organization. As Gen Zs enter the workforce, companies can’t afford to stick to conventional systems and frameworks. A tailored solution is required for Gen Z that can deliver products, services, or results, and drive business.